Increase your visibility to increase your chances of being seen. Police officers investigating motorcycle accidents often hear “I didn’t see him!”. 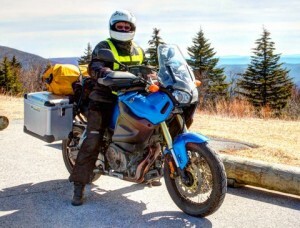 (They don’t hear “I didn’t hear him.”) As an individual operating a hard-to-see motorcycle on busy roadways, dodging potholes, watching for wildlife and distracted drivers, there is lots we can do. Taken from a recent FaceBook chat I facilitated on Motorcycle Mojo Magazine’s page, these riders weigh in on what works for them. Post your additions in the comments below. Oliver Kadrija. ATGATT – All The Gear All The Time. Tom Moreau. Lighting – front and back. Also, I fly a Cdn flag off the back of my Ultra. Its constant motion catches the eye of drivers following me. Oliver Kadrija. Remember to respect your bike or it will teach you a lesson. Nicole Beachboard-Dodson. For me, as a new rider, visibility is key, but skill building is my riding focus! I attend as many riding classes as possible each month as well as taking rides with my instructor friends! Practice, experience and confidence. Mike Pesdirz. This is such an awesome question. I feel like I should have an answer but I don’t……….is a bit scary to be honest! Nicole Beachboard-Dodson. I am looking forward to taking a dirt bike or off road clinic soon! It should help me tremendously increase my wobble skills! Gerard Erit. I wear a High Res Yellow Vest made by Olympia called Nova 2. Use it all the time, over a jacket or without. Also, planning on getting small lights for the fork (Clearwater Glenda) to increase my visibility…..to be seen versus seeing with them. Oliver Kadrija. Pulsing brake lights are awesome. Tom Moreau @Oliver, that’s what I have. What a difference! Pam Beatson. I put reflective tape on the back of my helmet and jacket, and also on the back of my bags when travelling to increase my visibility. I’ve actually taken some ribbing from other bikers about it, but that does not concern me! I think increased lighting is a good idea and I’m going to look into it with my next bike. Roni Van Der Velden-Clark. 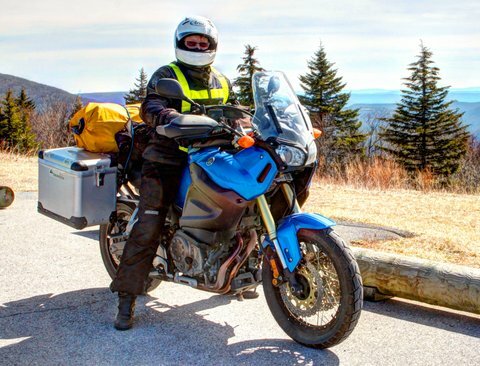 I have pig tails on my helmet… they move around and get me noticed by a lot of drivers… people laugh… but I get seen around town and on the highway… bright and reflective gear . Chris Townson. I started wearing a Hi-Viz vest last fall…. I now notice people actually stop at stop signs, see me in their mirrors. I always save space for an ‘escape’ and if you’re head isn’t on a swivel, you’re only counting down to the accident you will have. Jim Petrie. Hi-Viz works. Maybe they are thinking you might be a cop. Glenn Ranger. Don’t ride in blind spots. NOTE: These recommendations are from are from individual riders and are not my endorsements, except where noted. Use hand signals to indicate your direction and exaggerate your head movements when you look where you are going. The movement action captures the attention of drivers. Great ideas Devon. Thanks! Even better if you have something reflective on helmet, gloves. Excellent point Chris. I agree. It usually is done to give somebody the go ahead (or warn of cops:)) Let’s not be giving signals that imply the opposite of what we intended. I too wear a hi-viz vest, Liz, remarkably similar to yours. Also, a snazzy yellow full face helmet with reflective tape on the back. One can’t do enough to increase conspicuity amongst all the distracted drivers. No doubt that vest catches attention. Good choice! And the reflective tape on the back of the helmet is another excellent eye-catching idea. Drivers can look us in the eye and not see us – anything we can do to make ourselves more visible helps keep us safe. This is an awesome reflective vest with both interior and exterior storage pockets but could use a couple more. It’s highly visibility motorcycle vest and doesn’t try to blow away like other vests when riding. See why this meets the military specs.Thanks…!!! !